It is quite strange, I know, but Mack loved to recite and to sing television commercials. The dorkier the commercial, the more she delighted in it; and she just loved to annoy me by repeating advertisement dialogue and by singing the most irritating but catchy jingles. She started this habit in elementary school when she learned to mimic the old guy on the Menard’s home improvement commercials. She would bug out her eyes and clench her teeth just like he did, and then she would sing: “Save big money at Menards!” Her impersonation of that Menard’s guy singing that stupid jingle was PERFECT. Every time she did it, she cracked herself up; and, I have to admit, she made me laugh, too. Mack never grew tired of the habit of repeating catchy ad campaigns, and she frequently worked “ba-ba-ba-ba-ba…I’m loving’ it” into a conversation. She acted out and sang the “five dollar…five dollar…five dollar foot long” ad for Subway. And she could get oh so very hoedown when she belted out “Bob Evans…down on the farm.” Not only did Mack have a weakness for a catchy jingle, but she was also a sucker for the very ads that she so happily added to her repertoire. If she heard the Taco Bell bell and the words “Live Más” on the TV or radio, she went all Pavlov’s dog for a Crunch Wrap Supreme. If the goofy Sonic guys came on the tube, she would jump in her Jeep and go get an extra-large Ocean Water. And that damned “I’m lovin’ it” campaign led to Mack’s consumption of an ungodly number of items off McDonald’s value menu. During her senior year of high school Mack saw her first television commercial for Edible Arrangements, a delivery company that cuts fruit into the shapes of flowers and puts them together into bouquets. From the very first time she saw that ad, she so badly wanted one of those bouquets. Now Mack did, indeed, love fruit, but she was also an aficionado of the absurd; and those fruity flowers were nothing if not absurd. She started singing the jingle: “Make life a little sweeter with Edible Arrangements.” For months, she would recite that commercial, talk about the beauty of the sculpted fruit, and beg for a sublime bouquet of her own. She also noted that if I really loved her that I would have one of those things delivered to her at school for lunch. 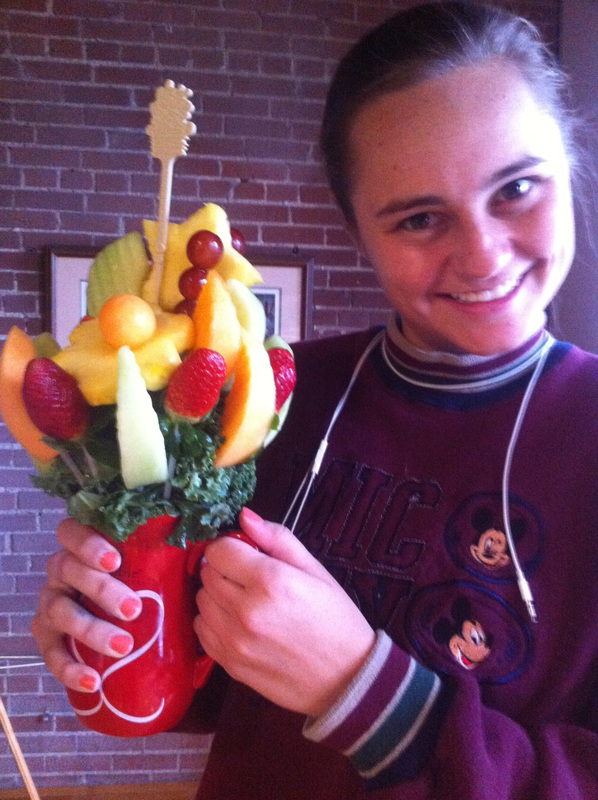 She drove me crazy with that Edible Arrangements refrain, so for her birthday that year I went online to order a fruit bouquet for her. But, alas, they were not available in Springfield. Why they were advertising in the Springfield television market where they would only break the hearts of teenaged lovers of fruit bouquets is beyond me. 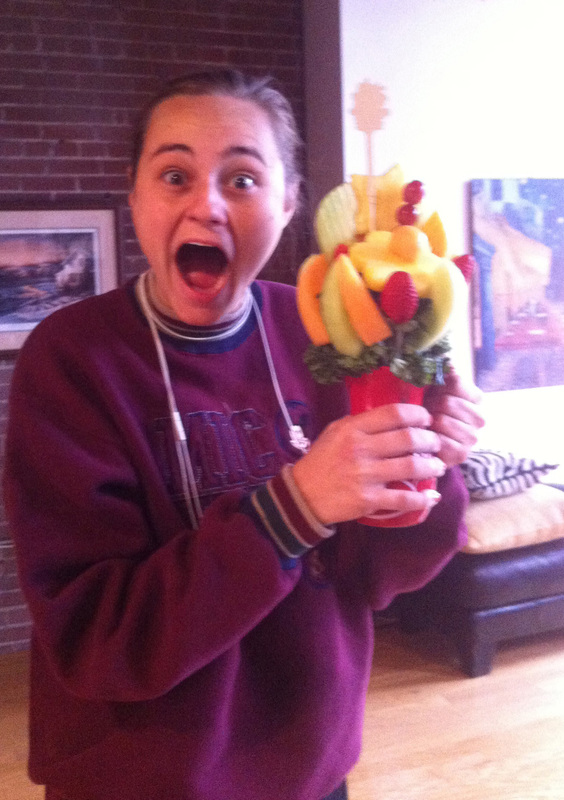 Sometime in the fall of 2012, after Kevin had moved to St. Louis and Mack was up at Truman State for her first semester of college, I was walking around downtown and happened upon a store front for Edible Arrangements. I was so excited when I saw that shop. When Mack came home at the end of the semester, we would be completing our family’s move from Springfield to St. Louis. We would be in our new home by Christmas. 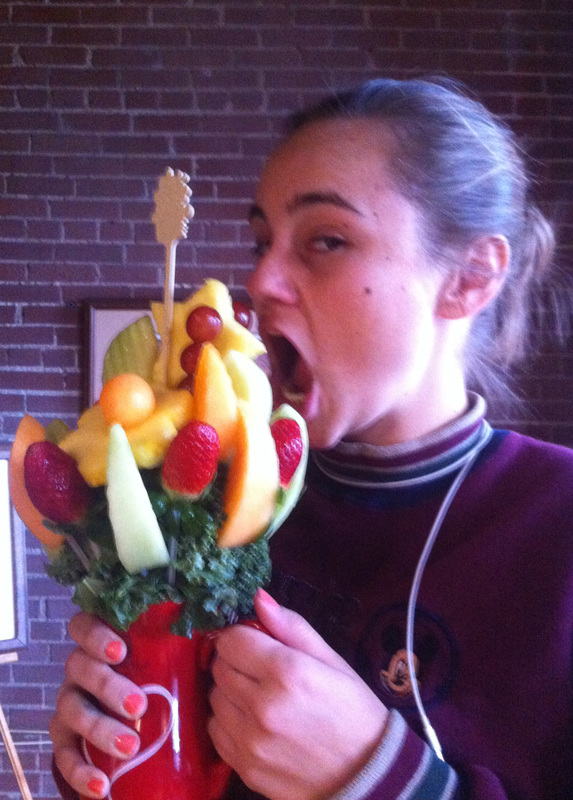 My crazy, jingle-singing baby girl would have a crazy fruit bouquet just in time for the holiday. And so it was, that in the afternoon on Christmas Eve, in a modern loft in downtown St. Louis, a small edible arrangement arrived for Ms. Mackenzie McDermott. She squealed with delight as she opened up the box, and as these pictures so aptly illustrate, she was thrilled with the bouquet but also appreciative of the silliness of it all. Mack’s good humor and joyous love of simple pleasures—like a ridiculous bouquet of fruit carved to look like flowers— always made my life a little sweeter. Therefore it was always easy, and one of the great joys of my life, to be able to give her so many of the things she believed made her life a little sweeter, too. I love that. Mack gave her all to all of us when we didn’t even realize it. Thank you Stacy for sharing. Love you so much.